← Happy Birthday, Pete and Petey! Did you know that? Well, whether you did or not, crack open a cerveza and read on…this recipe is a great way to celebrate. Words cannot explain how delicious this was. Seriously. Mouthwatering might be a better word to describe what was going on at our dinner table. Easy is another great adjective. I mean, anyone can make this and be successful. Low maintenance, people…very low maintenance. Plus, if you’re looking for something casual and delicious to make for company, it works really well because it basically takes care of itself. Put it on the list. 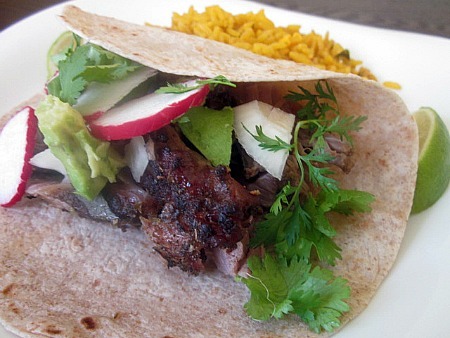 One word – carnitas. What does it mean? Little meats. What I think it means is AWESOME little meats. Now, there are no rules for how to eat this. Do what you like. Me, I had basically a burrito bowl – no tortilla, just meat and lots of toppings like sliced onion and radishes, jalapenos, avocado, sour cream, fresh cilantro and hot sauce. With some lime squeezed on top. Frank prefers the soft taco route and used small flour tortillas, with many of the same toppings. Use a fattier piece of meat for this dish – and don’t trim the fat before cooking! It helps with the flavor of the meat…a leaner piece won’t taste nearly as good. I will be making this again, SOON! Preheat oven to 350 degrees. Place roast in heavy oven proof pan/dutch oven. Squeeze lime and clementine juice over pork, then rub pork with all dry ingredients. Pour water around sides of roast, then add halves of fruit to water. Place onion slices on top of roast. Cover with tight fitting lid. Place in oven and set timer for 2 hours. Once time is up, turn oven off (do not open the door!) and leave roast in for another 2 hours. Remove and let cool for a few minutes before removing excess fat and chopping the meat. Have garnishes and tortillas prepped and ready to go when meat is cut. Build your own meal and enjoy! This entry was posted in main dishes, make ahead, Mexican, pork. Bookmark the permalink. 2 Responses to It’s National Taco Day! This looks so good! So versatile, too.